You know what would be cool? An action figure backed by the reliable name of Lego! Kopaka is the spirit of ice. He is cool, calculating, and coldly methodical in his actions. His long ice blade cuts and melts through the ice; one skillful swipe of it can cause avalanches or instantly freeze anything it touches. The least communicative of the Toa, Kopaka prefers to work alone, and will only join forces with the others if it's necessary for his own survival. Kopaka is most at home on the ice and snow of Mount Ihu, skiing up and down the slopes with amazing speed and skill. 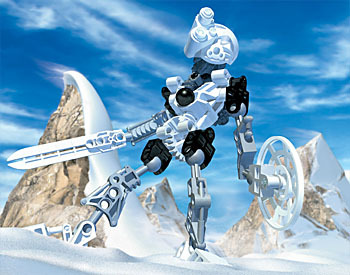 Koapka, the Toa of Ice, is part of Lego's new Bionicle line. For more basic information on the world of Mata Nui, read our primer course on the whole series. I really do enjoy this line. You get all the fun of building your average Lego set, but once you're finished you have something besides a static model to enjoy; each of the completed figures has an action feature that allows them to do battle with the forces of evil, and with one another. The main body of the Bionicle story revolves around the collection and implementation of various masks. Kopaka comes with "Akaku," the Great Mask of X-Ray Vision, which allows the wearer to see through walls and discover that which is hidden (that's the official description, by the way - it seems a bit redundant to me). 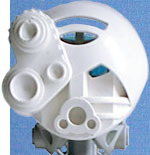 This mask is unique among its compatriots, in that it allows only one of the wearer's eyes to show through - the other half of the mask is designed to look like a series of scopes and lenses. Each of the robots shares the same face (among other things - the Bionicle line is great when it comes to economy of parts, as most of the bodies are built from the same pieces, just molded in different colors) which means that the masks are interchangeable, and that's where the collectability comes in. A mask will plug into the figure's "mouth," but it's still loose enough that it won't hold up to a child's rough play; however, that's an intentional choice. The masks grant power, so the goal in battle is to dislodge your opponent's mask - if the masks attached too well, knocking them off would be too difficult. The figures each have an action feature, controlled by means of a series of gears mounted in their shoulder. Turn the gear on Kopaka's back, and he swings his massive sword up and down. He has balljoints in shoulders, hips, and ankles, plus an additional balljoint at the end of his left arm, which allows him to "hold" his shield. 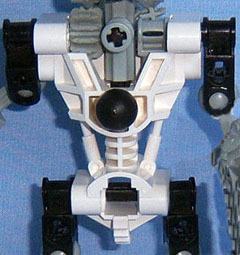 The figure is built of a white torso, mask, and feet, light gray limbs and head, and a translucent blue "brain" that also shows through as eyes. Comprising 33 pieces in all, set number 8536 stands approximately 7" tall when fully assembled. 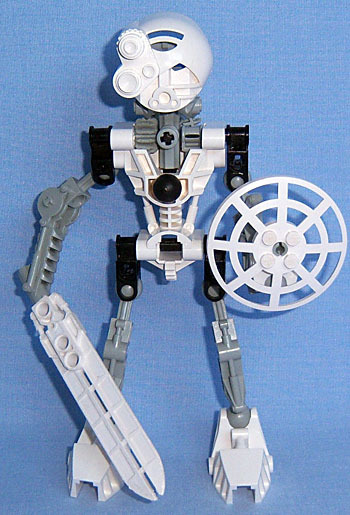 As part of the inauguration of a new line, and a whole new idea for the company, Kopaka has the standard high Lego quality and is truly a fun figure.